For a class assignment, I will be taking a few posts from blogs in my blogroll and taking ideas and doing what I can to build on them. Here goes nothin’. This blog suggests that perhaps Jones is trying to throw off other teams by feeding them a red herring. Don’t you just love NFL conspiracies and teams being tricksy? Jerry Jones takes a ton of flak from fans and critics, and it seems most people are in agreement that Dallas needs to take a good cornerback in this draft. My last post (game two recap) had several examples of poor play by the secondary. But, you know what, I should know by now never to expect anything when it comes to the Cowboys and the draft. Nothing is ever conventional with them. I can recall several times (most notably in 2004 when Dallas could have drafted Steven Jackson in the first round but traded down instead, opting to take Julius Jones in the second round) when Dallas was in a position to take a player that not only filled a need, but was also a premier player. So, all bets are off. 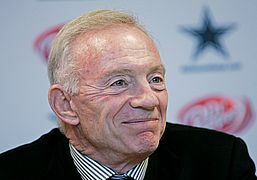 So, what is Jerry Jones thinking anyway? Jerry, please take a corner (or get Asomugha). This next piece comes from the Dallas Morning News and reporter Gerry Fraley. It also has to do with Jerry Jones, but not directly. It is actually written about Jason Garrett and what role he might play in the draft decision making process. As Cowboy fans are well aware, Jerry Jones is not just the owner, but also the GM, so he calls the shots when it comes to personnel. The blog states “Garrett said today that he will have a voice in the draft operation but will not make the final call on picks.” Not that I would actually expect him to do so. That’s what GM’s are for. It’s worth noting that he is at least going to have some input, though. It wasn’t too long ago that Jones and former coach Bill Parcells had a power struggle that included this aspect. If Parcells didn’t get a voice, I don’t see Garrett getting one either. I’m not sold on it. Like cornerback, offensive line has been an ongoing problem. This line is getting old quickly, as only one starter (Doug Free) is under 30, and this year was his first as long time starter Flozell Adams’ replacement. Incidentally, Adams will be playing in the Super Bowl, at Cowboys Stadium, with the Steelers, which is something he was never able to do while in Dallas. Honestly, if Dallas doesn’t go corner in round one, offensive line would be fine by me. The article also says that Jones felt Dallas was fine at the offensive skill positions. I don’t disagree with this, but there is one hangup I have about it: running back. I know Dallas supposedly has a “three-headed monster” at running back, but the running game has been terrible for a long time, not just during Garrett’s tenure as offensive coordinator. You can blame the line or the backs, I’m sure they are both culpable to some extent. Can any of these guys step up for Dallas in 2011? 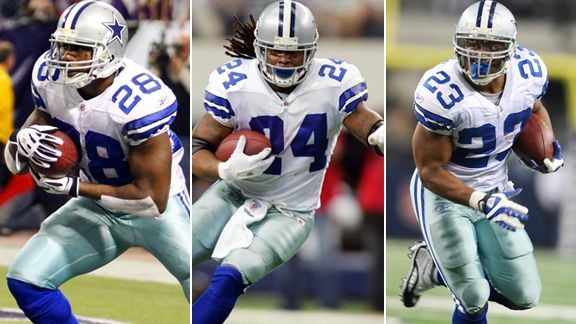 I mentioned the line issues, but as far as running back is concerned, Marion Barber (middle photo) just doesn’t seem to be the same player he was before he became the starter a few years ago, Felix Jones (left) is injury prone (as is Barber), and Tashard Choice has been inconsistent and doesn’t see the field much. I’m not suggesting that Dallas take a running back in round one, but the lingering problems in this area need to be addressed.